Photo of a cowboy seated next to his horse on a hill, looking down at other horses in Old West Bonham, Texas. June, 1910. The most fascinating part about this picture is how it conveys the rapid social evolution from the era of the old west to incredible technological advancement of the 20th century. You have to remember, this picture was taken only four years prior to World War I. By this time, automobiles were becoming more commonplace, the Wright brothers had made their historic flight at Kitty Hawk, and millions of homes were being outfitted with electricity due to the working populace having shifted to urban housing during the industrial revolution. And then you have this guy, the lone cowboy and his horse on the prairie, a living relic of a dying era. The cowboy of myth and reality had his beginnings in Texas. There cattle grew wild with few natural enemies; by the end of the Civil War there were an estimated 5 million of them. It was then that the cowboy entered his twenty-year golden age, 1866-1886, the era of the open range and the great cattle drives. The men who worked the cattle in the treeless expanses of the West, at least one-fourth of them blacks, became known as cowboys. The image of the courageous, spirited horseman living a dangerous life carried with it an appeal that refuses to disappear. Driving a thousand to two thousand cattle hundreds of miles to market; facing lightning and cloudbursts and drought, stampedes, rattlesnakes, and outlaws; sleeping under the stars and catching chow at the chuckwagon—the cowboys dominated the American galaxy of folk heroes. Even their dress inspired envy. The cowboys’ hats were high-crowned with wide, floppy rims, practical for protection from the sun’s glare, useful as a cup with which to scoop up water or, folded over, as a pillow. The bandana handkerchief tied around the neck could be lifted to cover mouth and nostrils from dust. Originally the collarless shirt and trousers were nondescript, of flannel or wool. A vest was often worn; it gave some protection from cold winds and also had a number of useful pockets, one of which held Bull Durham tobacco and cigarette papers. The boots with heels two inches high, the better to rest in the stirrups or dig into the ground while roping a calf, may have appeared exotic to a dude, but they were absolutely practical. 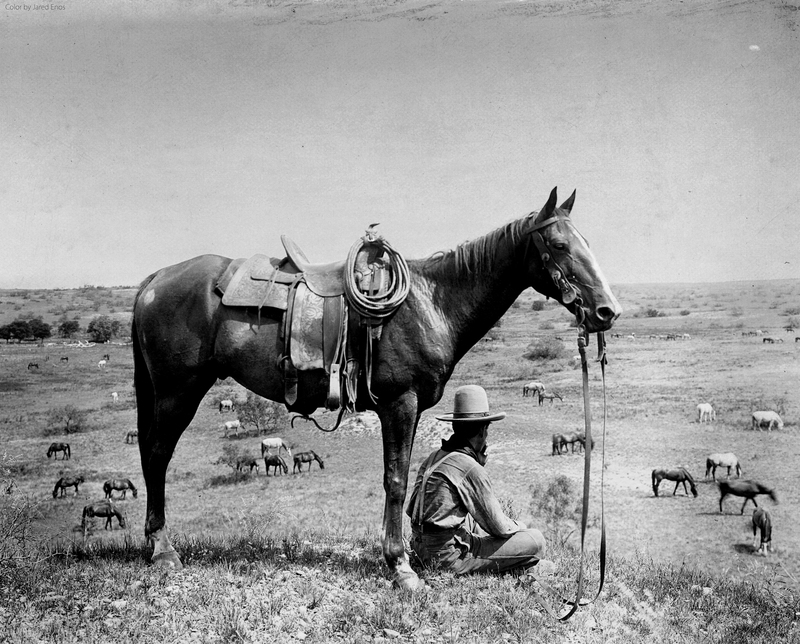 The stock saddle’s design traced all the way back to the Moors of North Africa, having come to the American cowboy by way of the Spanish and Mexicans. Chaparejos, or chaps, served a valuable purpose when a cowboy had to chase after a steer into a patch of thorny mesquite. A bridle, a lariat, and, during the cattle drives, probably a well-balanced six-shooter completed the cowboys’ outfit. (Photo credit: Library of Congress / Erwin E. Smith / Colorized by Jared Enos / Original version).